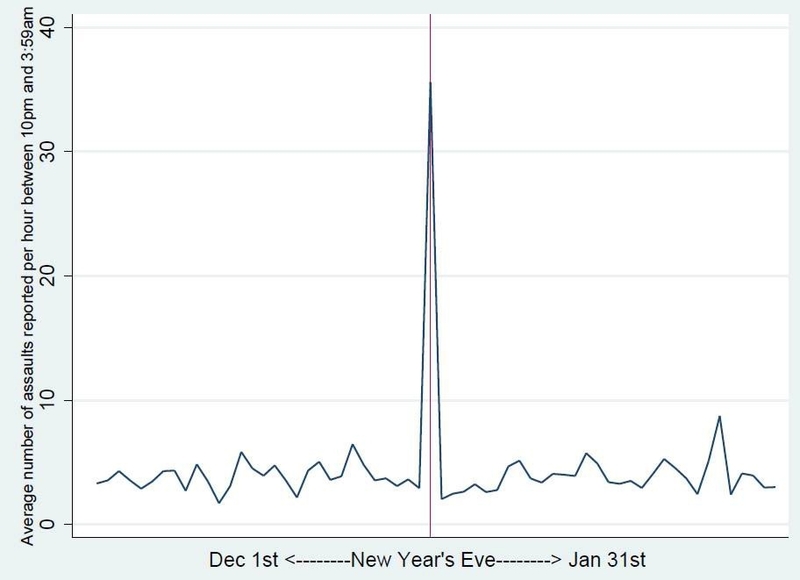 A sharp spike is seen in the average number of assault cases reported on New Year’s Eve. A five-year study at Curtin University�s National Drug Research Institute found people were most likely to be involved in an assault between December 31 at 10pm and January 1 at 3.59am. Alcohol Policy Research team leader Professor Tanya Chikritzhs said the sharp increase was likely due to the effects of alcohol on both perpetrators and victims. �We know from studies that assaults that occur at night time � between 60 and 80 per cent� are likely to be alcohol-involved and New Year�s Eve is probably way up in the 90 (per cent),� she said. Prof Chikritzhs said the spike could come from pressure among friends to enjoy the celebrations and most assaults occurred in a domestic setting. The confronting findings align with research by the Curtin-based National Alcohol Indicators Project, which associated violence to late-night alcohol trading. �There is no doubt late trading hours has a major influence on levels of violence,� she said. �For assaults we found for an extra one or two hours open after midnight the risk of assault increases 70 per cent and there is a 49 per cent increase in drink-driver road crashes and that is a Perth study.